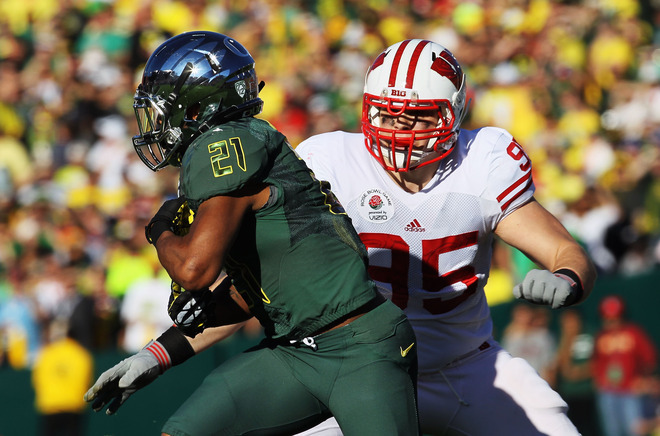 The Ducks are going to make another uniform splash on Monday when they take on Wisconsin during the Rose Bowl. Check out this video of the helmets. 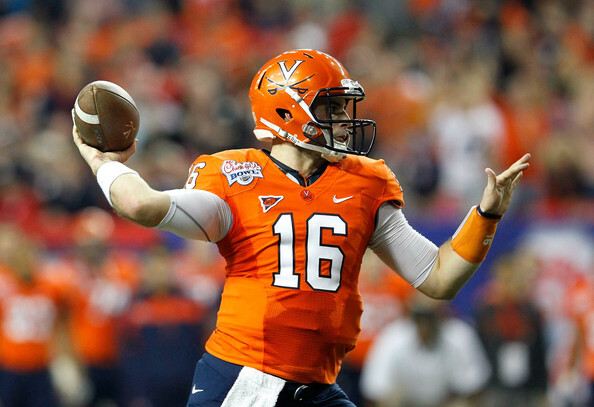 Week 12 College football review: What in the world? Supporting our troops is a great thing. They put their lives on the line for our country, and do things that most of us don’t have the bravery to do. This sentiment has made its way into college football in a big way this season, and it came to a head on Saturday with South Florida. 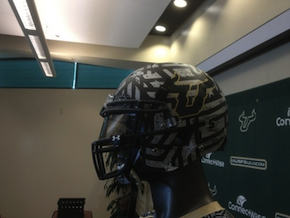 The Bulls came out with some helmets that better resembled a zebra than a football uniform. 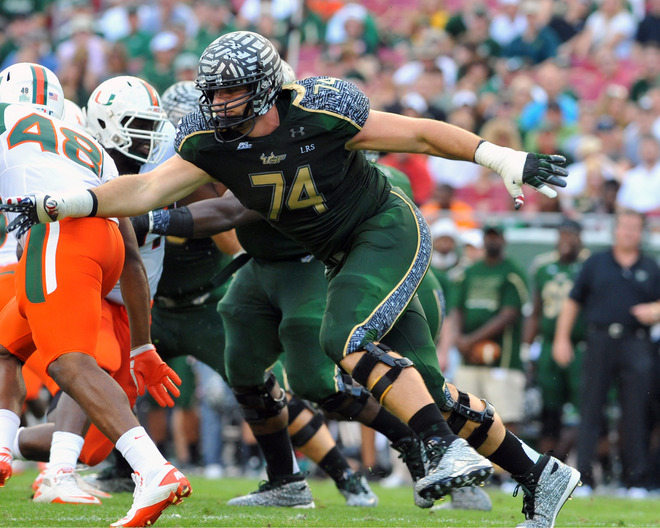 There was not even an indication of the usual South Florida logo on these helmets. I will admit I did not get to watch any of this game, but just from looking at the photos, I am taken aback by these helmets. Other teams like South Carolina and Texas Tech have used these Wounded Warrior uniforms in the past, but there was never a huge change like this to the helmet. The Bulls committed a cardinal uniform sin by stunning the viewer with their uniforms. The pattern on the helmets was very different to figure out, and it’s very tough to be aware of what exactly they were going for with the design. 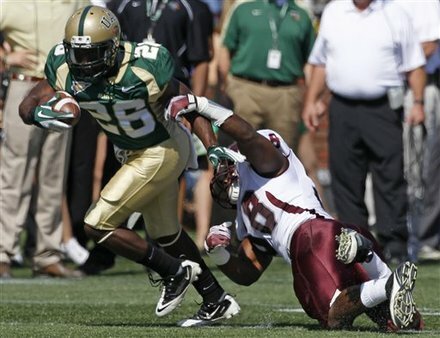 The original prototypes for these helmets did have the South Florida logo on them, but when they were brought out on the field, they were gone. A swing and a miss here. 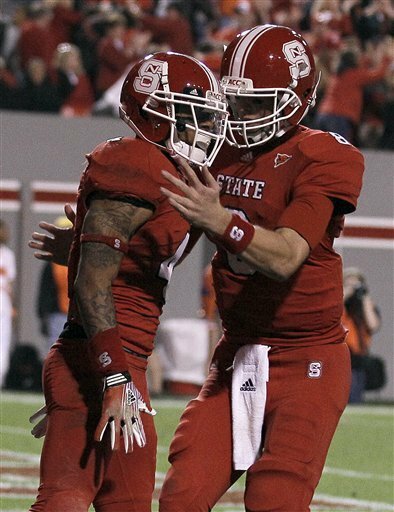 N.C. State, who never goes outside the uniform box, went with all-red in a huge upset of Clemson. The look is pretty basic, and would be something the Wolfpack might consider going back to considering the success they had with it on the field. 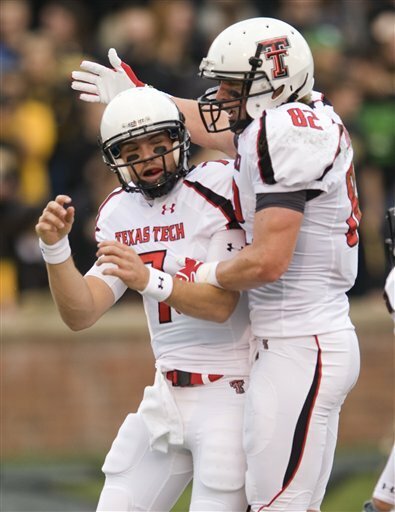 Texas Tech went with all-white against Missouri. Again, nothing too exciting here, just a uniform change. 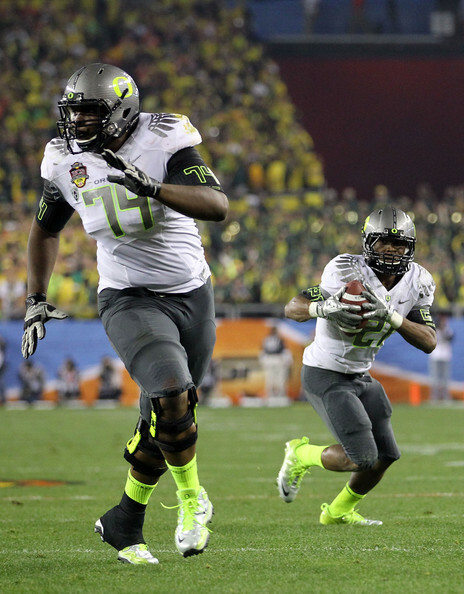 Oregon went with all-black in a loss to USC, but it was somewhat sloppy. Instead of going with the neon on black like they did in the season opener against LSU, these silver numbers with yellow outlining didn’t have the same look to them. Outside of Ohio State’s pro combat uniforms in an upset victory over Wisconsin that we will get to later, the uniforms in college football were pretty standard on Saturday. Therefore, we’ll take some time to go over the pioneers of this uniform revolution, Oregon. We all know how how Oregon had come since its plain green-and-yellow look to the safety green that made a splash in last season’s national title game. At first all their uniform changes were viewed as corny and a stunt, but now they are the pioneers of a great recruiting tool that has seen the Ducks rise to national prominence on a consistent level. One thing that I always wonder with Oregon is what their fans wear to games. We’ve come a long way in fan apparel since the days of fedoras and suits in the stands. The standard look for a fan at any football game now is a jersey of their favorite team. With all the looks Oregon employs, how can a fan of the Ducks know exactly what to wear as they head to Autzen Stadium. It’s neat to be wearing the same thing as the players on the field, but for Ducks fans, it is more of a crap shoot to see if you can actually accomplish that feat. On the flip side, it also gives fans an opportunity to show their favorite color of the Ducks. They are not restricted to just one jerseys, but literally dozens. Must be fun (and a little confusing) to be an Oregon fan. 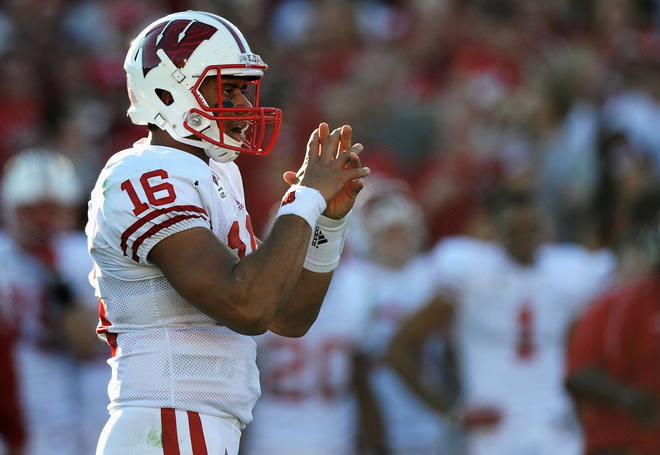 Ohio State had one of the more unoffensive pro combats for their upset of Wisconsin. A friend said earlier in the week the helmets look similar to Georgia’s from Week 1, which is true. However, the colors of the jerseys and pants look like the Buckeyes. It was a pretty good look. 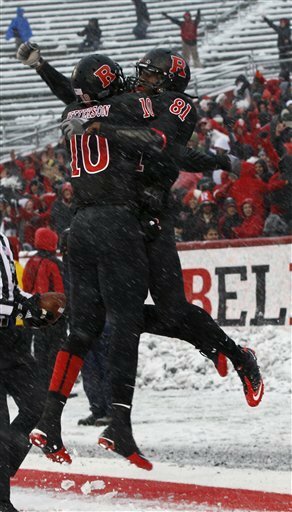 Rutgers again went with an all-black look in a snowy loss to West Virginia. 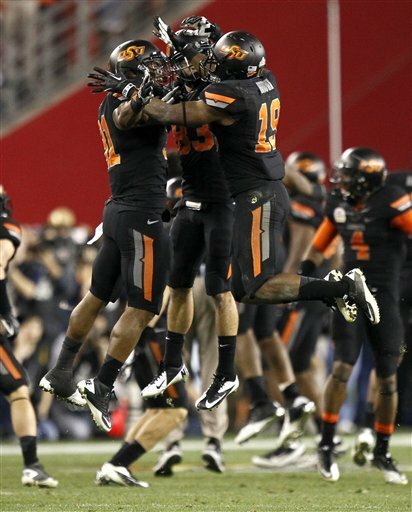 I think they might have gone with these black uniforms to stand out from the white field. Either way, I’m looking forward to the Scarlet Knights actually going back to being Scarlet when they take on Army this week at Yankee Stadium. 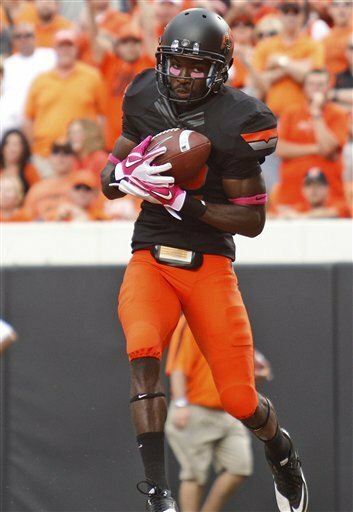 Oklahoma State finally went with orange uniforms at home, but ruined the look with gray helmets and pants. 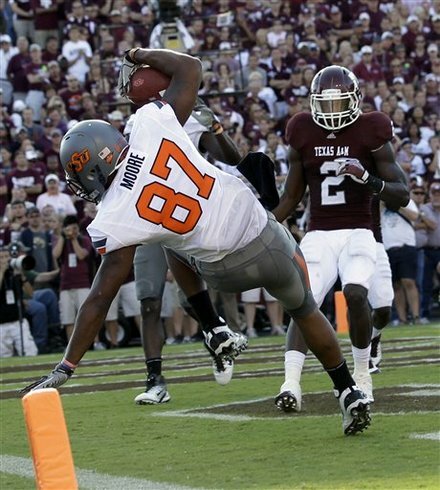 Maybe they are waiting for the key Bedlam games against Oklahoma to get it right. Virginia Tech looked a bit like the Cleveland Browns in a victory over Duke. Kentucky and Mississippi State changed things up a bit. Kentucky wore these odd all-black with blue accents. While the Mississippi State wore a matte finish to their usual helmets. 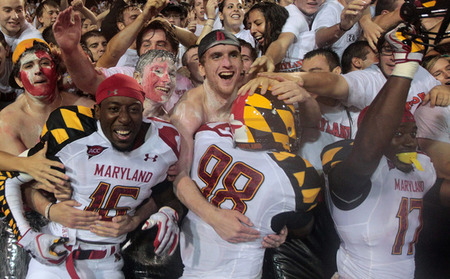 The biggest splash in college football uniforms came right off the bat on Saturday. As soon as Lee Corso picked Oregon to defeat Arizona State, ESPN switched to the Michigan-Michigan State game. 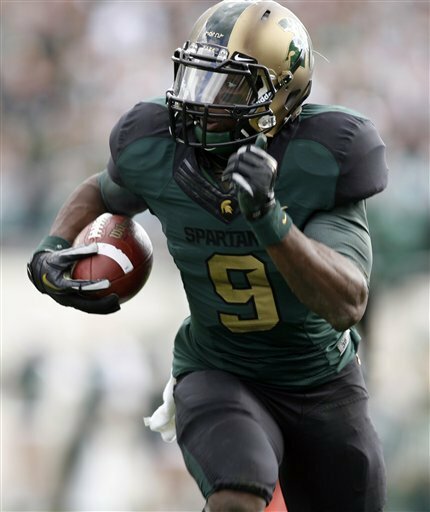 We’ve known for a long time the Spartans would use a UAB-type look for this game, but Michigan’s throwback look came as a surprise. The coolest thing about Michigan’s throwbacks was they didn’t warm up in them. The Wolverines were in their usual road unis before that feature maize pants before changing to the 1970s throwbacks for the game in East Lansing, Mich.
I’ll start with Michigan. 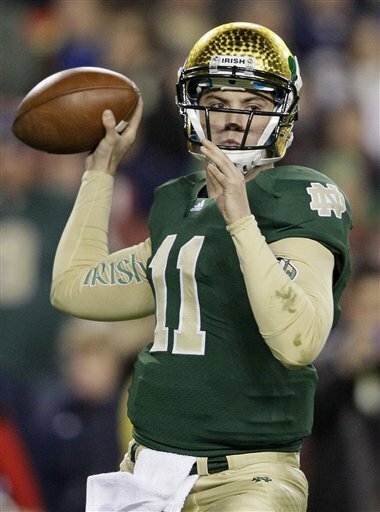 I was hoping before the game they would go with something similar to the heritage uniforms they wore against Notre Dame in Week 2. The difference here is maize as the prominent color on the shoulder stripes instead of the blue, the number replacing the M on the front of the jersey and no stitch details on the numbers. It’s a pretty solid look overall. The big numbers on the back of the jersey work well as do the small numbers on the helmets that don’t get in the way of the helmet design. The only thing that bothers me with these uniforms is the Wolverines basically look like bumble bees. The prominence of maize on the stripes gives off that illusion, and since they are at the shoulders they are always seen by the fans. Now on to Michigan State. The Spartans looked totally unrecognizable for this game. The usual green and white combination for home games was totally thrown out for this rivalry game against Michigan. The last game of the night was a uniform special as Oregon and Arizona State faced off. 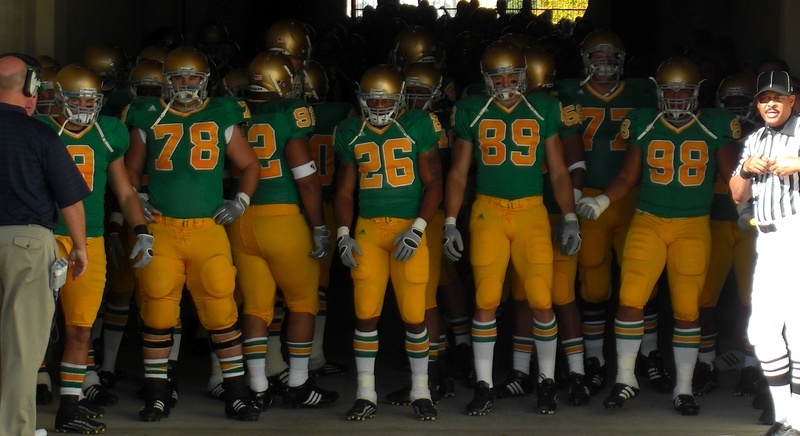 The Ducks’ uniforms were average, nothing too special. Arizona State also looked pretty conservative with their maroon helmets and pants for a road game. 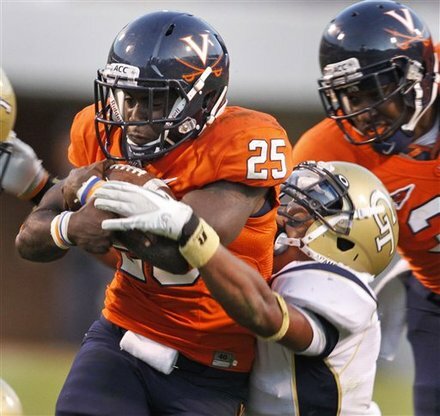 Virginia donned some nice orange and blue uniforms for their upset victory over Georgia Tech. 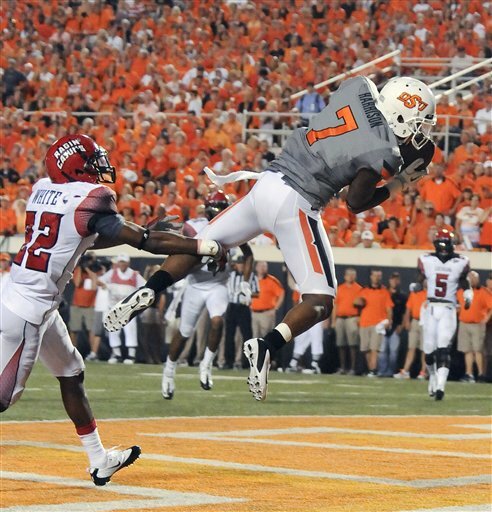 I’m still waiting for Oklahoma State to wear white helmets with orange. Their black-on-white-on-black look this week was just all right. 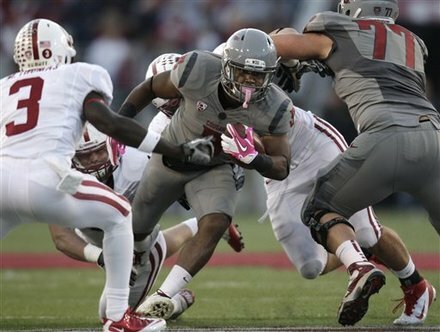 Washington State went with an all-gray look against Stanford. 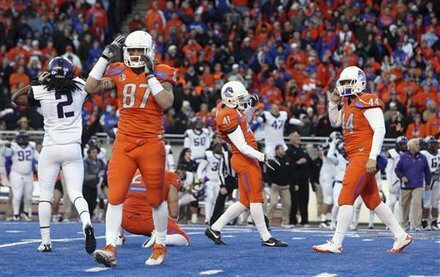 The Cougars have been down for a long time, so I guess they were trying to get hyped up for this one. It didn’t work. 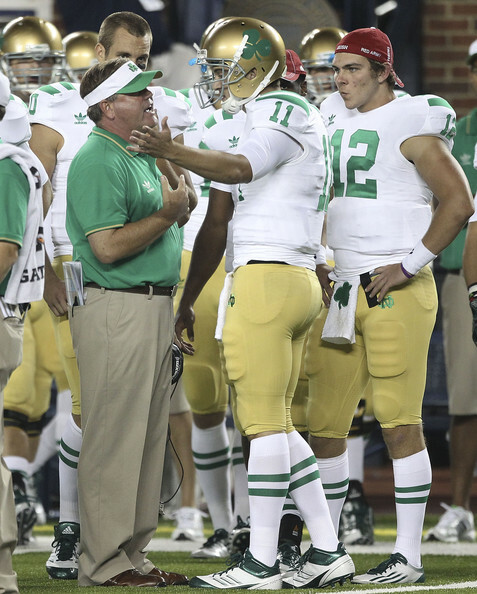 This week’s choice in college football uniforms was about as exciting as the games. Which is to say there was a very limited amount of excitement to be had. 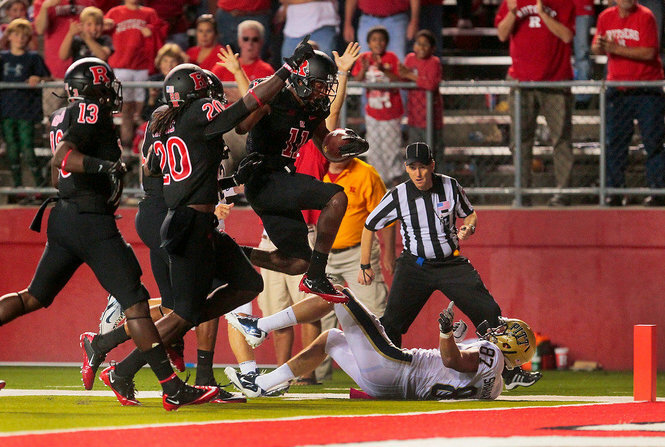 The biggest splash of the day might have come from the local team as Rutgers decided to ditch its Scarlet-ness and go with an all-black look on a hot day in Piscataway, NJ. When I first saw these uniforms on ESPN’s famous Uni-Watch before the season began, I was very disappointed in the Scarlet Knights’ decision to become the Black Knights for a day. I was also concerned the players might pass out from heat exhaustion because of the 85-degree temperatures throughout the Garden State on Saturday. However, as the day turned to night and I started looking at more photos of the game (and probably because of how well Rutgers played) the uniforms grew on me. Guys like Rutgers’ best player Mohamed Sanu looked pretty cool in the uniforms, especially with the pink accents with the mouthguards. I am usually not a fan of the matte finish on helmets, but over time I think it looks good depending on the circumstances. They seem to me that it would make the player’s head more hot because it looks like the surface of a road, but I guess it worked for Rutgers. The only thing that bothered me about this uniform was the red Rs on the helmets. It was pretty obvious it was a decal, but I am glad they went with red instead of the usual white R on the helmets. Oregon went with these “Fighting Ducks” uniforms in its victory over Cal on Thursday night. These were new looks for the Ducks, but the matte finish on the black helmets and the black pants had been seen before this season, in a loss to LSU. Perhaps the best touch of this uniform was the ducks on the shoulders. It was a bit corny, but it was fun. 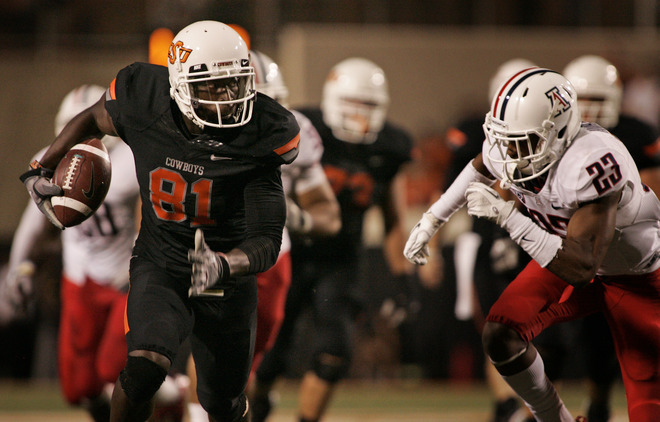 Oklahoma State wasn’t slowed at all by what must have been a hot day for them in black-on-black-on-orange uniforms in a romp of Kansas. I’m still waiting for them to go with their usual home uniforms once this season. 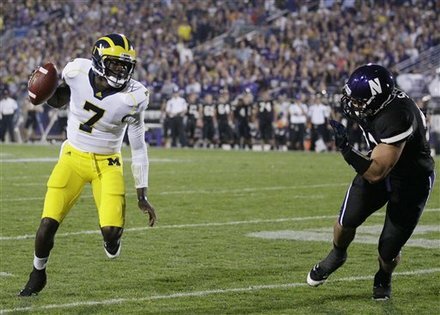 Northwestern kept the all-black trend going with their night loss to Michigan. 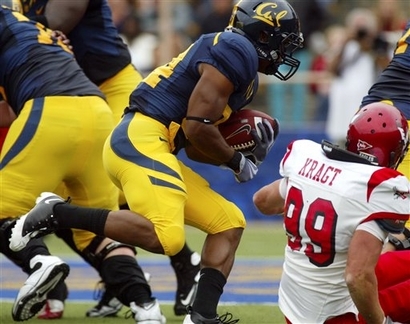 Arizona State looked like the old Arizona State with these yellow helmets and pants for a road game at Utah. Seattle probably won the U.S. Open Cup Tuesday night by simply blinding Chicago with these uniforms. Tuesday night while watching SportsCenter after a long night of work because of those damn Yankees, I noticed a uniform that was more than a little shocking to see at 3 a.m. It was a highlight of the U.S. Open Cup finals between the Seattle Sounders and Chicago Fire. Yes, MLS teams play in a tournament outside of the regular season as one of the teams, Seattle, is preparing for the upcoming playoffs. Don’t ask me why. Soccer is a weird game. Anyway, Seattle was wearing those uniforms that look like someone took a highlighter to the entire uniform. There seems to be something about teams in the Pacific Northwest and highlighter uniforms. The Seahawks have worn a blinding alternate from time to time. And Oregon introduced us all the “safety green” with their socks in last year’s National Championship Game. Even the Mariners use a teal color that looks pretty awesome for select home games. Now that we have ventured out into the world beyond football here, expect a few more adventures soon with baseball getting into its League Championship Series starting soon and hockey on the horizon.